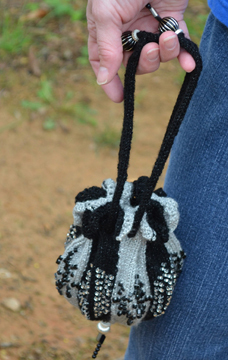 Inspired by Hermione Granger’s beaded bag, splashes of beads and a frilly finish make this bag fun for anything from a glamorous night out to stashing a ball of yarn on the run. The little bits of beading, color work, lace and I-cord are a good way for beginners to experiment with new techniques without committing to a large project. 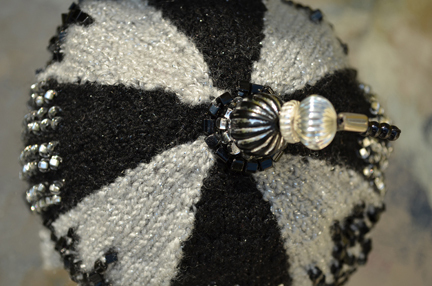 Knitters that like a challenge will like this quick project. Make them in different colors and as gifts. The bag is knitted flat using Vanna’s Glamour yarn in four 2 color sections to minimize sewing and to keep yarn management simple. For a little bag, it’s amazingly roomy for whatever little bits you need to carry, but I still can’t make the undetectable extension charm work! 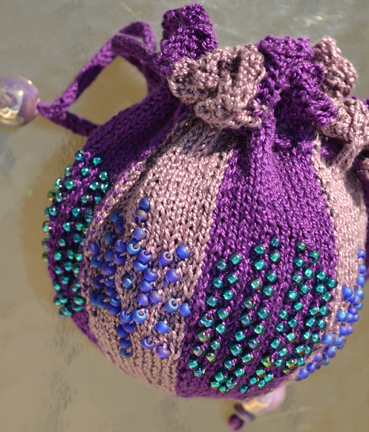 The purple version is knit with DMC #5 perle cotton with US 2 needles. Have fun with color and yarn variations. Gauge is unimportant, just keep in mind that the bead size should be approximately the same size as a stitch of the chosen yarn, and the yarn should be knit fairly tightly to minimize stretchiness. It would be great to be able to pack nothing but this bag for a long trip, alas, I can knit better than I can do magic. I absolutely love this bag! 😀 I am just making one myself.